Hey everyone, I hope you are having a good day! Today I just wanted to show you one of my favourite types of nail art...leopard print. I use the infamous technique by Gem which is so easy yet so effective. I used a Model's Own WAH! Nail Pen to create the black pattern. 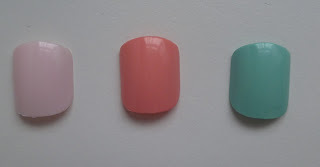 This time round I wanted to use some of my favourite nail polishes which are my Essie ones. I only have a few but they really are lovely colours and I would really miss them if they weren't in my collection anymore. I have the three pastel shades Fiji (which is a very pale pink, almost white), Van D'Go (which is a darker but dusky pink) and Mint Candy Apple (which is the very hyped pastel green). Essie polishes are pretty pricey at £7.99 but I think they're worth it because they have such an unusual colour range which you wouldn't normally find anywhere else. The colour pay off is pretty good as I would say a maximum of two coats is needed. These three colours work really well together which is why I decided to use them to create my leopard print. I hoped you liked my small Essie nail collection and my leopard print nails. So pretty :) I love Van D'go, Fiji is next on my list. I really love your nails they look amazing!! Hey hun, I've nominated you for a Leibster Award! An award especially to appreciate great blogs with less than 200 followers, Congrats, and head to my blog to see what to do next!